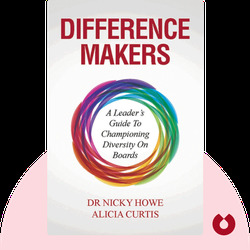 Difference Makers (2016) makes a compelling case for the value of diversity at the top of today’s companies. 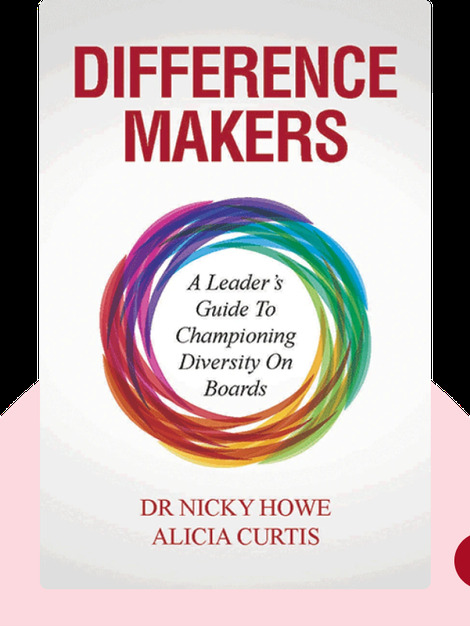 Written by two leading champions of inclusive leadership, these blinks guide readers through personal and boardroom strategies to overcome bias, foster open dialogue and spark innovation by getting more voices to the table. Nicky Howe is a CEO who specializes in helping individuals, organizations and communities reach their potential. She holds degrees in business administration and management and teaches at the School of Business at the University of Notre Dame Australia. Alicia Curtis is one of Western Australia’s leading social and business entrepreneurs and an award-winning speaker and leadership facilitator. She holds a degree in business leadership and was named in the Australian Financial Review and Westpac’s 100 Women of Influence List in 2014.